Tandem Twinning: Pregnancy: What to Eat? This is one of M.O.M.’s most-pondered questions, and probably the least-answered. Most everything in the books is geared to singleton moms. And even then, the standard pregnancy book doesn’t include much detail about nutrition, even less how to manage getting all that low sodium, preservative free, fresh fruit and vegetable, lean protein baby fuel in your belly when you can hardly keep down Ramen Noodles and hardly stay awake late enough to brush your teeth before hitting the hay! But that’s why we’re all here, isn’t it!Rather than write a book on the subject (that's already been done) , I’ll save you the trouble and do my best on what kinds of foods to eat, how much and how to do it without hiring a personal dietitian and chef. First of all, I think the most important thing is that it doesn’t matter if you are overweight, you need to eat a sensible diet of nutritious foods in amounts that roughly match your hunger. Being pregnant with two or more babies is NOT the time to ignore your hunger or worry about your waste line - manage your cravings, yes perhaps – but NOT your hunger. That is your body talking to you, and your body is very smart. Listen to it. Learn to recognize what it is telling you. If you can learn to do this you will be well on your way to a healthy pregnancy and birth. I have not known a doctor to give any woman of any size a prescription on how much weight to gain when she is pregnant with multiples. I was overweight for a 5’ 3” person starting at almost 150 pounds, but my doctor never told me to slow down. She said the more I gain the better. If your doctor does advise you to limit weight gain, I would seek another opinion or input from another physician in the practice. Also consider requesting a consultation with a dietitian. I gained 60-70 pounds during my first twin pregnancy, and lost all but 15 of it immediately (much of it was edema and swelling). I shed most of the rest off with the South Beach Diet, which lasted until my second pregnancy. Perhaps you don’t want to gain extra weight, but to me, it was well worth the peace of mind to know I was getting the needed nutrients to my babies. I would do it again to have healthy babies again (and in fact I did)! An extra pant size is a much more pleasant prospect than premature or low birth-weight babies - and poor nutrition has been linked to. Though I don’t encourage stressing over your weight, I think it is helpful to know where you are at on the continuum of average so you know what challenges you might have. According to the 'Mother of All Pregnancy Books' , twin moms should gain about 4-6 pounds during the first trimester and 1 ½ pounds per week on average after that. I have heard from several sources that gaining 24 pounds by 24 weeks is a goal for twin moms to strive for. As you can see, I’ve attached photos to some of my posts of my pregnant belly with my first set of twins. I also noted my weight one each as well as my belly’s growth measurement! Hopefully this will help satisfy your curiosities about what your growing body might look like! My first pregnancy was really the beginning of my journey in nutrition. I grew up drinking Mountain Dew and eating Pop Tarts and sometimes worse for breakfast. Really. So I had no clue. I thought a slice of wonder bread with butter was pretty balanced. Now I see it as equal to eating a cup of sugar with butter on top. If even I can convert to somewhat-more-nutritious-eating habits without feeling like I am living a destitute life, you can too! Not that I eat great. But it’s certainly better than I did the first 20 years of my life! 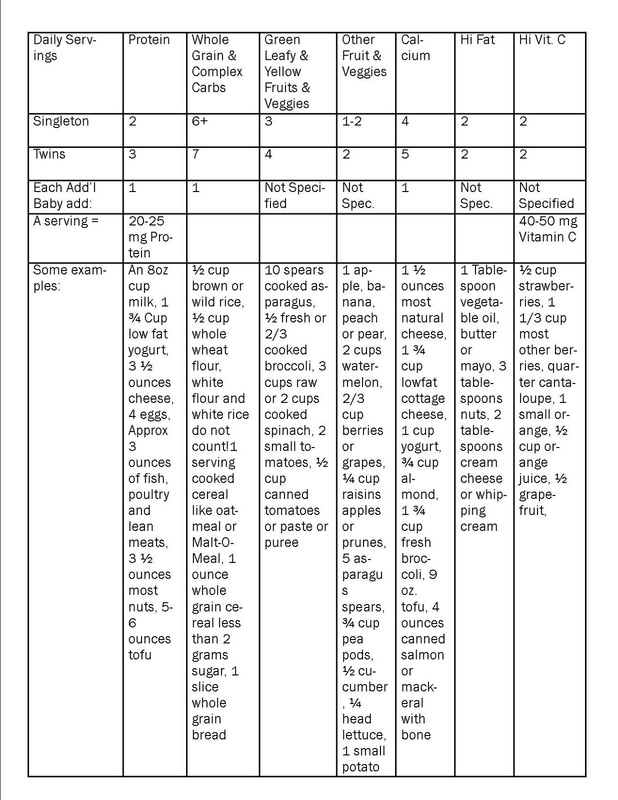 Since it seems otherwise elusive, here is a chart of how many servings of various food types you should have if you are carrying 1,2 or more babies. I created this chart with information from ‘What to Eat While You are expecting’. Keep in mind that if you drink a glass of milk, that one serving would count both as a protein and a calcium serving, so adding up the number of servings of all the groups does not create a grand total of servings you are to eat daily. Now this chart looks all scientific and such. But I really don’t think you must run out and buy a food scale or an iPhone app. Charting your intake is not a necessity to eating right during pregnancy! I think if you have an idea of what your body needs, and you occasionally count how many items you ate from a given category that day, you have done your babies a great service. Note that white bread and empty carbohydrates do not even appear on this list! It is significant, and is consistent with the nutrition wisdom of the day that I have read elsewhere. If you haven’t learned to find ways to enjoy eating whole grains, the time to experiment is now! Whole grain breads needn’t scratch your throat on the way down. Whole grain crackers with a smear of cheese are a great snack. I think the best impact this chart should have on you is not what you choose out of your fridge, but what you choose at the supermarket. If your fridge is stocked with good choices, it makes it hard to mess up! with no added sugar. Definitely get some protein bars. These were, ok ARE my favorite! – the ones sold near the pharmacy section of the store. Keep them in your purse, desk and car glove box so that you never let your babies go hungry on account of your schedule! Keep hard boiled eggs handy in the fridge for a quick protein and Omega 3-packed snack. Try a pomegranate, star fruit or other fresh fruit or vegetable you haven’t before. Or try eating a food you didn’t like before with a new sauce or dip. One thing that changed my fresh fruit & veggie eating habit was buying Tupperware Fridgesmart storage containers that helped preserve freshness, and stack efficiently in my fridge. It was a lot easier to cut and keep melon, lettuce and veggies in a nice sleek and efficient rectangular boxes with lids instead of in the glass mixing bowls with plastic wrap on top that I once used! And it stayed fresh longer, so that it tasted better for more days. Previously, slicing a melon meant making a commitment to be sick of eating it in 2 days. When it comes to cravings, indulge with this caveat: Make yourself ‘pay’ for the right to indulge by first eating something from the healthy list. This will provide more needed nutrients for baby, and fill you up so you eat less of the indulgent food. Also, when you are at the store being tempted to buy that indulgent food – buy the most healthy version of it that still tastes like a treat to you! So instead of Ben and Jerry’s Ice Cream, pick one with perhaps less fat or less sugar and more calcium and protein compared to the others. If you start searching for nutritious foods at the store, you will find them in your cupboard when you are hungry! AFTER babies are born if you want to take off some midnight ice cream! It is a diet book, but the ‘Stage III’ of the diet is no longer a weight loss diet. It is a recommendation for life-long heart-healthy eating and is quite educational about how our bodies work and process food. It is also somewhat consistent with other nutrition wisdom I’ve read…it just has the added benefit of explaining WHY it’s important. I also love the The Dr Sears Nutrition Deficit Disorder Book . It explores what a healthy diet is for children, and that is exactly the journey you are embarking on! It too, warns of nutrient poor carbs and spends lots of time on which additives and chemicals are of questionable safety. It also speaks in depth on the benefits of Omega 3 fatty acids. I began to take an Omega 3 supplement early on and make a conscious effort to eat Omega-rich foods because of the potential benefits it has for baby. If there is one truth I found in both my pregnancies about morning sickness, it is that it is that nausea is much worse on an empty stomach! That may seem counter intuitive, but I’ve found it to be true both in pregnancy and other general nauseous situations (insert snide in-law remark here!). I had nausea my first pregnancy, and it was generally worse in the morning than any other time of day. I did find a way to cope though! I did everything I could to keep myself from getting hungry because when I did get hungry, I also felt nauseous. For me, this meant eating plain Ramen Noodles for breakfast the instant I woke up! It also meant keeping snacks and protein bars in my purse and at my desk so I could have them at any time. Though I did not have very severe morning sickness, early morning was the worst, and once I got some noodles or dry cereal in me, I felt a little better. After that, I still felt a little off most of the time through that first trimester, and even until 16 weeks, but there were only a handful of days that I was so miserable that eating even the most benign food wouldn’t help. BTW – it is thought that keeping yourself full with high protein and fiber foods keeps nausea at bay. One idea to combat morning sickness is to munch on a high protein or high fiber snack during one of your late night/ early morning potty runs. Sure it may not be convenient to eat, but just a few handfuls of cereal or a cheese stick could help keep your blood sugar consistent and prevent that early-morning sick feeling. I kept a box of mini-wheats at my bedside for those early am hunger pangs. And what about eating the ‘healthy foods’ when you can’t even keep crackers down? My advice is to eat whatever can make a truce with your stomach! Just make an extra effort to eat only A list foods when you aren’t feeling sick! If you find that you are daily fighting the urge to ‘toss your cookies“ and loosing, try talking to your physician about treatments for morning sickness. There are a few drugs out there to help you, and they are vital for Mothers of multiples who need to keep nutrition going to their babies from early on. You don’t need to suffer helplessly. Good post! Yup, 24' by 24 wks is the Golden Rule for moms-to-be with twins. Weight gain is important as you just wrote. Researchers speculate that it helps build a strong placenta which in turn helps to prevent premature and low-birth weight babies. Pregnant women should choose what they eat to avoid health problems. Taking vitamins and supplements can also help support your health; check out Vitamins Canada now.